Take a ride on a Hobie Kayak, featuring Hobie's patented MirageDrive pedal system, which is easier & faster than paddling AND leaves your hands free to do some fishing, use a camera, or enjoy a cool drink. Learn about kayak fishing on a Hobie Pro Angler, the thrill of sailing a Hobie Island, or the sheer fun of any of the MirageDrive models. Try your hand on a stand-up paddleboard, the newest and hottest way to "surf" on flat water. It's easier than it looks, and you'll be surprised at how much fun an on-water workout can be! Learn how you and your family can enjoy unlimited boating...without owning a boat. 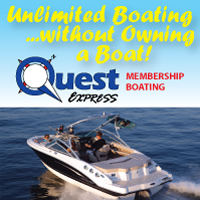 Get on-demand access to a fleet of premium Quest Express boats, and never worry about maintenance, cleaning, insurance, or making a boat payment! Grab your swimwear or active clothing, some sunscreen, and expect to thoroughly enjoy your day trying one or more of these great water-based activities! 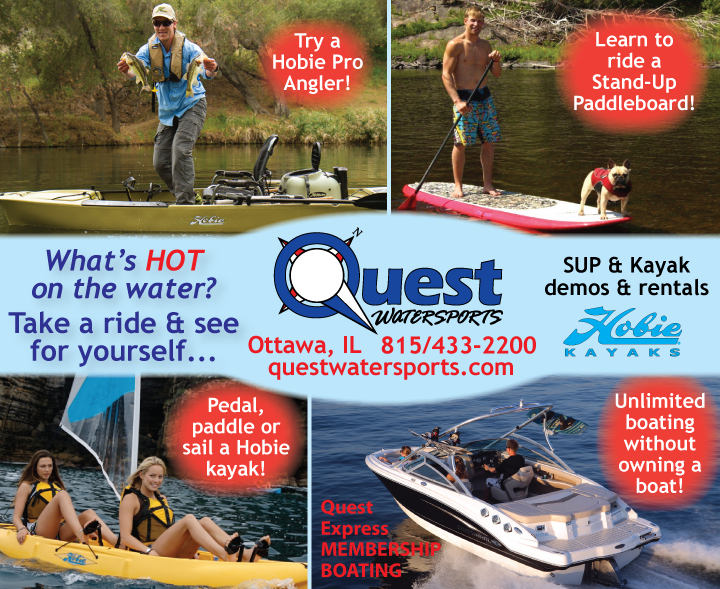 RSVP to Linda at 815/433-2200, or linda@questwatersports.com.